Quincy Notre Dame Cross Country is a sport for motivated, hard-working individuals who crave personal challenge. At QND, we focus on commitment, improvement, fitness development and a positive team atmosphere. The Cross Country programs for both the Raiders and Lady Raiders strive to offer student-athletes the physical fitness and psychological confidence to excel in the sport, but more importantly, develop strong character traits to meet challenges in life. 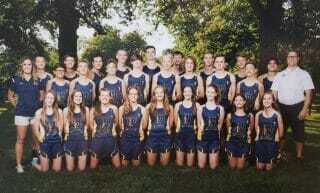 The Quincy Notre Dame Cross Country Teams consist of a closely-coached co-ed, varsity, and junior varsity program. For the 2018 season, QND competes with 19 Raiders and 10 Lady Raiders. Both teams practice together and attend the same meets. Typically, cross country races are three miles in length. These meets usually take place in parks or golf courses. Teams are scored by the fastest 5 runners. Individual runners benchmark their success by comparing their personal-best time or finishes. Academics play an important role in any student’s life. The Cross Country athletes at QND take this role to heart. For the 2017-2018 season, both boys and girls teams earned the IHSA Team Academic Achievement Award!! The boys team achieved a 3.47 cumulative team grade point average. The girls team achieved a 3.78 cumulative team grade point average. These awards mark the twelfth straight year both cross country teams have earned this honor! The Raiders and Lady Raiders of the 2018-2019 season are ready to continue this great scholastic success.